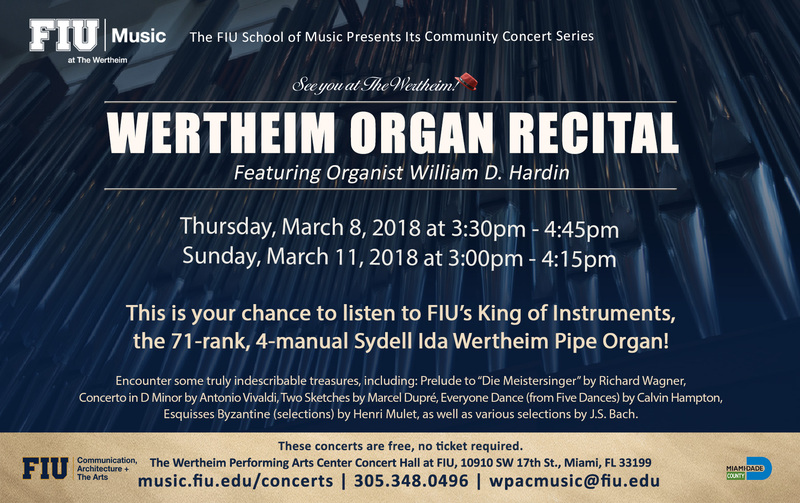 Join guest organist Dan Hardin for an exciting organ recital featuring FIU’s King of Instruments, the Sydell Ida Wertheim Organ at The Wertheim Concert Hall! This is an exceptional chance to encounter some truly indescribable treasures, including the Prelude to “Die Meistersinger” by Richard Wagner, Concerto in D Minor by Antonio Vivaldi, Two Sketches by Marcel Dupré, Everyone Dance (from Five Dances) by Calvin Hampton, Esquisses Byzantine (selections) by Henri Mulet, as well as various selections by J.S. Bach. This concert is free, no ticket required. The Sydell Ida Wertheim Concert Organ is the spotlight of the Herbert and Nicole Wertheim Performing Arts Center. The prestigious 125-year-old Schantz Organ Company took nearly a year to build the 26-ton organ that is the largest in Miami-Dade County and one of the most technologically advanced in the country. The university dedicated the concert organ to the memory of Dr. Herbert Wertheim’s mother, Sydell Ida Wertheim. William Dan Hardin is Music Librarian at Florida International University. He holds the Doctor of Musical Arts degree in organ performance and literature from the Eastman School of Music, the Master of Music degree from Northwestern University, the Bachelor of Music degree from Mars Hill College and a Master of Library and Information Science degree. Dr. Hardin is co-author (with N. Lee Orr) of Choral Music in Nineteenth Century America: A Guide to the Sources. (Scarecrow Press, 1999). He is also a pre-publication manuscript reviewer for the Routledge Press’s Music Bibliography series. At FIU, Dr. Hardin teaches the graduate music bibliography course and is organist at the Wertheim Performing Arts Center Concert Hall. He is also a member of the Miami chapter of the American Guild of Organists and a past Dean of the Ft. Lauderdale chapter. From 2002-2015 he served as Organist and Choir Director at St. Stephen’s Episcopal Church in Coconut Grove.